Researchers combined innovative crystal growth, highly sensitive magnetic measurements, and the controlled introduction of disorder through electron bombardment to create and study an entire range of compositions within a class of iron-based superconductors. 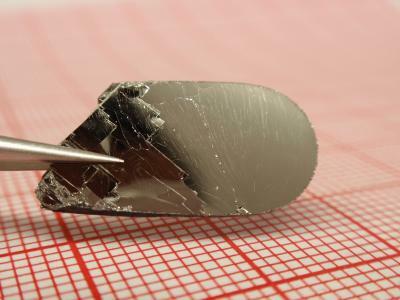 They found that the key fundamental properties–transition temperature and magnetic field penetration depth — of these complex superconductors were dependent on composition and the degree of disorder in the material structure. "This was a systematic approach to more fully understand the behavior of unconventional superconductors," said Ruslan Prozorov, Ames Laboratory faculty scientist and professor in the Department of Physics and Astronomy at Iowa State University. "We found that some proposed models of unconventional superconductivity in these iron-based compounds were compatible with our results, and this study further limited the possible theoretical mechanisms of superconductivity. "Researchers combined innovative crystal growth, highly sensitive magnetic measurements, and the controlled introduction of disorder through electron bombardment to create and study an entire range of compositions within a class of iron-based superconductors. They found that the key fundamental properties–transition temperature and magnetic field penetration depth — of these complex superconductors were dependent on composition and the degree of disorder in the material structure. "This study fleshed out the knowledge of a class of materials more completely and in a way that will be helpful to the scientific community as they search for high temperature superconductors. Knowing how transition temperature is affected by composition, magnetic field and structural disorder gives science a better idea of where to dig–it contributes to the goal of discovery by design, creating materials that do exactly what we want them to do," said Prozorov. Can we find more benign nanomaterials?